When the Trump administration earlier this year made it easier for small businesses and self-employed workers to band together to buy insurance that didn't have to abide by all the Affordable Care Act rules, supporters of the ACA exchanges feared the worst. Would easing restrictions on association health plans lure healthy people out of the ACA markets, causing premiums to spike for those who remained? Would consumers be duped into buying skimpier coverage that left them unprotected in a crisis? But most of the early association health plans being formed or expanded under the June rule claim to comply with ACA mandates, and say they aren't charging people different premiums based on their health conditions or barring people with pre-existing conditions from enrolling. Sponsors of the plans also say they cover each of the essential health benefits, provide broad networks of doctors, and don't impose annual or lifetime limits on coverage. And despite claiming to not cut corners, these association plans are still able to offer lower premiums than comparable plans on the individual insurance exchange, the sponsors say. In the latest example, farmer-owned cooperative Land O'Lakes said its self-insured association plan, which it is expanding to farmers across state lines under the new rule, will cost about 25% to 35% less than exchange plans in Nebraska, and 10% to 12% less than comparable plans in Minnesota. Pamela Grove, senior director of benefits for Arden Hills, Minn.-based Land O'Lakes, said the plan primarily achieves savings because of its size—about 44,000 farmers will be eligible in Minnesota and Nebraska—not because of any skimping on coverage. The plan started as a pilot in Minnesota. Land O'Lakes, several Nevada chambers of commerce, and the National Restaurant Association have formed association plans this year and each say they want to do what's best for small businesses and their workers by providing an option that may be a better fit for a family than what's available in the traditional individual and small-group markets. The Labor Department loosened restrictions on association health plans by allowing them to serve more employers and self-employed people in the same industry nationwide or in different professions within the same geographic region as a single large employer. Previously, association plans had a hard time meeting ERISA's large-employer insurance requirements. The Labor Department estimated that 4 million people could be covered under association plans in the coming years. Some healthcare advocates and ACA supporters railed against the rule, saying it would expand the availability of junk health plans and undermine the exchanges. Democratic attorneys general in 11 states and the District of Columbia sued in late July to block the rule, and that case is pending. Some state insurance regulators, such as those in Massachusetts and California, have issued emergency rules and guidance limiting what association plans can do within their borders, fearing that access to the plans could destabilize their markets and lead to fraud and insolvencies. 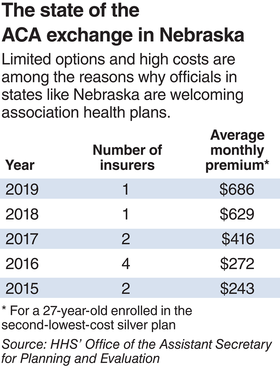 But in a state like Nebraska where choice on the ACA exchange is lacking and premiums have soared, regulators welcome the chance to bring in new competition. Medica is the only insurer offering coverage on the ACA exchange. The average monthly individual premium for the second-lowest cost silver plan is rising 9.1% to $686 before subsidies in 2019 compared with 2018, according HHS data. Laura Arp, Nebraska's life and health administrator, said the plans look a lot like what's offered on the ACA exchange. Modern Healthcare reviewed the plan documents for Land O'Lakes' eight Nebraska plans, including a platinum-level plan, one gold plan, and three silver and three bronze options. They feature a range of deductibles and appear to provide coverage for each category of essential health benefits including prescription drugs, maternity care and mental health and substance abuse treatment. Land O'Lakes leases its network from Cigna Corp. in Nebraska and PreferredOne in Minnesota. Medica is also offering an association plan with the Nebraska Farm Bureau in 2019 with average premiums about 25% less than a comparable individual exchange plan, said Geoff Bartsch, vice president of Medica's individual and family business. Like the Land O'Lakes plan, Medica's farm bureau insurance will cover all the essential health benefits and will not charge more for or exclude those with pre-existing conditions, he said. Medica is able to offer lower premiums because the group of potential farm bureau members is relatively healthier than the individual market. That said, Bartsch also explained that the plan will set premiums based on age, location and industry, and is considering varying rates based on gender in the future, which will also allow some savings. ACA exchange plans are prohibited from varying rates based on industry and gender, but the Labor Department rule allows it. In Nevada, a fully insured association health plan offered by several chambers of commerce offers HMO premiums at up to 15% to 20% less than comparable exchange plans, despite offering robust benefits, because its partner UnitedHealthcare will attract enough volume to command lower rates, said Scott Muelrath, CEO of the Henderson Chamber of Commerce. Still, the plan will vary rates based on age, occupation, location and group size. Aaron Frazier, director of healthcare policy at the National Restaurant Association, similarly said members will see lower premiums because of the combined purchasing power of its small businesses. insured means it will avoid certain state premium taxes, and it won't have to pay a “risk load” or profit margin to a health insurance carrier, Condeluci explained. The plan also will vary rates based on ZIP code and age, leading older members to pay as much as four times what younger members pay. ACA exchange plans are limited to charging older patients three times more. Insurance experts said those explanations make sense. “AHPs can offer comprehensive coverage and still be cheaper than marketplace plans if they either serve a population that is less costly than the average of the marketplace and/or they somehow are able to pay less for services,” said Katherine Hempstead, who directs the Robert Wood Johnson Foundation's work on health insurance coverage. The Trump administration rule did leave the door open for some plan sponsors to skimp on coverage. And it is possible that some could claim to cover the 10 categories of essential health benefits, yet still not meet federal standards, said Sabrina Corlette, health insurance expert at Georgetown University. Critics of association plans also worry they will lure healthy individuals away from the ACA-compliant markets, causing premiums to spike for those left behind. But Land O'Lakes and the Nebraska Insurance Department rejected those concerns. Ramge, the Nebraska insurance director, said most of the people with ACA coverage receive some type of subsidy; the association plans will attract those who don't qualify for federal financial assistance. And since the plan is not charging premiums based on health status, Land O'Lakes' plan gives all farmers—healthy and sick—another option, Grove said.